Large on-deck master with King & gorgeous full beam marble bathroom with stall shower - gorgeous! - best in the show - + amazing VIP cabin located upstairs on the bridge deck with view - bed faces forward through windows overlooking the bow and 180 degree windows +4 very large guest cabins below, 2 with 2 Queen-size beds & 2 with 1 queen bed, all very large and all with en-suite bathroom. 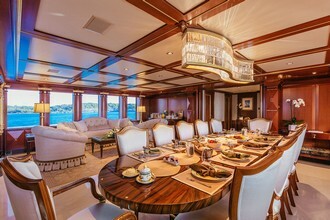 Offering flexible accommodations, incredible deck spaces, fabulous toy selection & “rocking” crew, including extremely talented chef Michael Wilson: imaginative, global & highly skilled, the 160′ Delta (USA) motor yacht, MY SEANNA, is available for charter during the Summer of 2017 in the West Med, Croatia, and Adriatic between April and September, 2017. 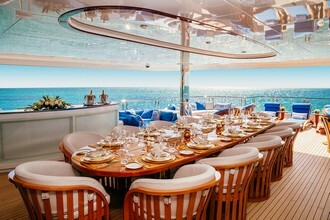 MY SEANNA is the perfect yacht for Event charters including the Cannes Film Festival, the Monaco Grand Prix, and the Cannes Lion Festival. Discretion is guaranteed for high profile guests with staff. Fun-filled family charters are accommodated with all the toys! One of our favorite vessels, MY SEANNA was originally built as a 160’ Delta (USA) power yacht in 2002, but she was extended 25 feet in 2014 to 185 feet. This was to give her a longer waterline, so she’d be more economical on fuel…. 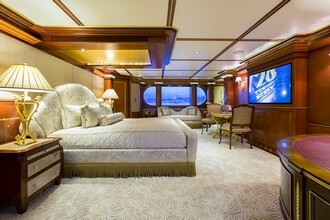 Accommodating up to 12 guests in 6 staterooms, including a full beam master with the best bathroom in the yacht show, plus fabulous full-beam VIP stateroom located on the bridge deck with bed facing forward through windows over the bow and a 180 degree view, the guest cabins are among the largest of any we’ve seen on a charter yacht. Two have not one but two (2) Queen size berths and two have one Queen berth, making the yacht ideal for two principal charterers with children, or six couples, or multi-generational families of nine, where everybody gets their own berth…. The owner of MY SEANNA does not use the boat. The crew of 11 was assembled with the full intent to charter. 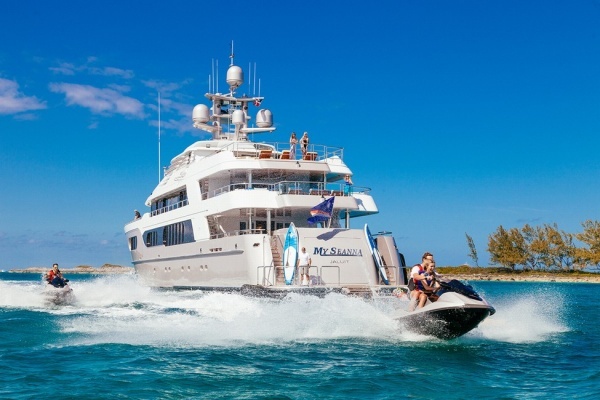 American captain Todd Lee loves chartering and will be as interactive as guests want, tendering guests in to shore and around bays on the yacht’s 40 foot Van Dutch tender, or the crew will be formal; they read guests well. 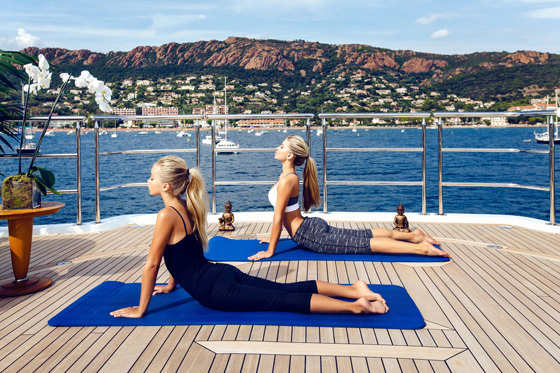 The sun deck on MY SEANNA is a fabulous space with exercise equipment, sauna, TV, Jacuzzi, giant projector screen for outdoor movie night, sunbathing chairs, oval bed, barbecue…. There’s a private sunbathing nook on the Crow’s Nest, a small 4th deck above the Sun Deck. Ninety percent of the meals are served on the bridge deck aft, which has many colorful table settings. 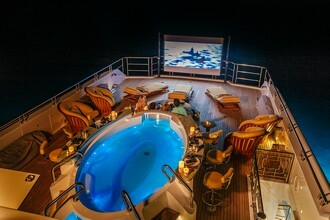 This aft deck adjoins a sky lounge, which works as the media room…. 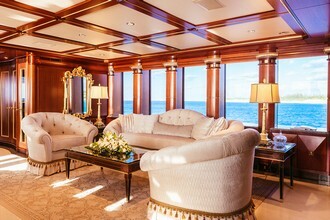 The main saloon is comfortable and traditionally decorated with sofas, arm chairs, dining table, stairwell to the aft guest cabins, and it opens to a spacious aft deck with coffee tables. Just under it is the Beach Club. Available in the Caribbean and Western Mediterranean, MY SEANNA carries 2 Wave runners, a 3-deck water slide, 2 kayaks, 2 stand-up paddle boards, 2 Enzo electric bikes, a drone, treadmill, cross trainer, and more.